Editor’s Note: This piece won 3rd Prize in the first annual SAGE Magazine Young Environmental Writers Competition. Photo by A. Kathleen Higgins. Colorful umbrellas dot the landscape in this high-altitude desert, shelter from the blazing July sun. Improbably enough, a square kilometer of ice will cover this same steep slope by December. Right now a backbone of stone bunds and empty cement irrigation canals trace a skeletal path down the slope. Beginning in October, metal gates will open, diverting some of the nearby glacial stream into Mr. Norphel’s canals. Over the next three months, these small diversions of water will flow through the canals and into a neighboring valley, where the stone walls will fraction the water into six small portions. These small portions of water, like small ponds in a forest, will freeze solid well before larger rivers do. Once frozen, an additional layer of water is diverted to wash over these portions and link them together into a single mass of ice that starts to look like a hockey rink. More layers can then be added until it begins to resemble a glacier, though Mr. Norphel chuckles when recalling one year when he let too much water onto the frozen mass. Temperatures were warm, and the additional water turned the ice into slush. “We are always learning how to make it work better,” he said. By the end of December an “artificial glacier” will have formed, a massive kilometer-long stretch of ice. To Ladakhi children, it’s a dream ice hockey rink in their backyard. But, far more important, for farmers who can look ahead to the first buds of spring, this new fabricated glacier may mean an extra crop per season, or enough water to revive fields that have recently been left fallow due to diminishing water resources.As one quiet Ladakhi engineer, Mr. Nazir, puts it, “When there is no water there are no humans.” He chuckles as he says this, but there is sadness in his eyes. Because the Tibetan Plateau is warming up on average two degrees Celsius faster than the rest of the world, the effects wrought by climate change are felt acutely in Ladakh. “I sweat more now when I am working in the fields. It is definitely warmer now than when I was young. Maybe this is climate change,” says one Ladakhi farmer, Tsering Tundup, of Rumbuk. “The whole valley here used to be covered in ice. When you went to town, you would have to decide if you should take the horses or the donkeys, because the horses slip more, and often they would break a leg on the ice and die there. The snow was so deep it covered the tops of the trees in the riverbed. Now we get maybe one foot of snow here.” Mr. Norphel has been listening to these anecdotes of climate change for years. “When I was young, ten or eleven, we had very heavy winters. All was fully covered in snow, and in the mountains at least eight to ten feet of snowfall. Now, the last four decades, we are having less snowfall. The glaciers are receding.” While climate change can be a political topic for some, Ladakhis roll their eyes at this idea, at the arguments that climate change is not happening. They only know what they see, and they see changes in the weather, in their water, and, ultimately, in the amount of food they produce to feed themselves. Despite the golden fields of barley rippling in the autumn breeze or the dark reds of apricot trees weighted down with fruit at summer’s end, Ladakh is a desert. Determined farmers in the rain shadow of the massive granite Himalayan massifs carve patches of green earth out of sun-bleached sand and rock. Situated on the Western edge of the Tibetan Plateau, Ladakh depends on the glacial melt flowing down from Himalayan glaciers. British mapmakers in the 1700s struggled to understand the complex watersheds of the region–the unexpected rivers springing from rocks, their sources somewhere in the sky. Ladakhis believe that the lu, or water spirit, causes the water to erupt from cliff faces and may leave if people become too greedy. To keep the lu content and the water flowing white silk scarves embossed with circular Buddhist symbols festoon ice-encased cliff faces, tied there at considerable risk to life and limb in a show of gratitude. As spring arrives, the Ladakhi ready their fields in the lag between warming temperatures and the weeks when the water reaches the villages. Valley temperatures become warm enough to plough and sow the fields in March or April, depending on altitude; altitude also determines when the glacial melt reaches a village, as late as May or June in some places. Ladakhis are accustomed to the rhythms of this miserly environment, and make up for this short agricultural season by working from sunrise to sundown once the meltwater reaches their fields. 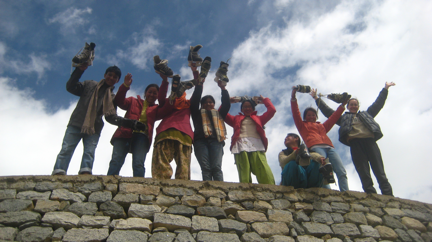 Mr. Norphel explains the peculiar Ladakhi summer further, “The glaciers start melting in June. The sowing season begins in April and May. Summer season is very short, just a single crop. If the farmers don’t get the water at the right time, there is no crop that year.” Mr. Norphel’s artificial glaciers help smooth this uncertainty and provide water early to farmers who would otherwise wait weeks to sow their fields. A period of relative calm follows in mid-summer, and then another flurry of activity in August through October during harvest. The last remnants of the glacial melt trickle down from the mountains in October, after final irrigation and harvest. Freezing occurs shortly after, with winter effectively halting the running clock of irrigation that drives Ladakhis to work twelve-hour days when water is available. In the stillness of winter, the cavernous family homes, quiet and empty during the summer days, become bustling hives of activity, families gathering around the kitchen stoves, enjoying the warmth and the fruits of their summer labor: barley flour noodles, carrots, and potatoes in thick stews. In the past thirty years, Ladakhis have observed the strange flow of glacial streams through November and into December, a result of warmer fall temperatures. It remains too cold to grow anything, so the water purls through hibernating villages and down to the major rivers, primarily of the Indus watershed. It weaves through Ladakh and crosses the Indian border to Pakistan then disperses into the Bay of Bengal where the glaciers – in some way, Ladakhi livelihoods – are lost at sea. Observing this in 1985, Mr. Norphel began to wonder: What could Ladakhi villagers do with this unseasonal and wasted water? When the seventy-five year old Mr. Norphel was growing up, Ladakh was an isolated oasis in the Himalaya. Most people carried out their lives never leaving the region. Without television, phone lines or electricity, their world was smaller. Yet Mr. Norphel’s parents knew that their son was especially smart; he had a knack for fixing things and was good at math even as a young child in the village elementary school. His parents made the difficult decision to send him away to school. They packed him a backpack of food and sent him over the mountains at the age of twelve, telling him to “walk down the mountain” until he reached the town of Leh, and from there to take a bus to Srinagar, in Kashmir. While walking around his property one winter, Mr. Norphel noticed that a small stream had frozen solid under the shade of a poplar grove, though it flowed elsewhere in his sunny yard. He suddenly had the inspiration to apply this natural principle to his work engineering irrigation systems. “The artificial glaciers are to supplement, not replace, the natural glaciers,” explains Mr. Norphel. In the quiet of a winter weekend afternoon, at home in his backyard, Mr. Norphel had come upon an idea that could dramatically increase the amount of water Ladakhi villagers have available for agriculture. Upon reaching retirement, Mr. Norphel began to pursue this idea full time. In October and November above the villages of Ladakh, Mr. Norphel shifts large rocks and diverts fast-moving water from the main glacial stream into his canals. These stretch as far as a kilometer in some sites, winding around to reach a nearby unoccupied mountain valley. He shifts the rocks back into place after a few hours. Though temperatures reach the freezing point during those months, the main stream charges too quickly to ice over. Cold-climate homeowners who leave their pipes running through the night to prevent freezing are familiar with the simple principles of thermodynamics applied here: to discourage freezing, increase velocity; Mr. Norphel employs the reverse tenet: to encourage freezing, decrease velocity. At the end of his canals in the empty valley, water slows to a trickle, gradually spreading over the cupped ground, and then it freezes in a series of small pools. Later, Mr. Norphel again shifts the big rock to allow more water into the valley. The ice thickens as this additional water freezes. He repeats this process again and again, adding inches of ice to the valley each time. The process is similar to creating a backyard ice skating rink. Patience and observation are required to avoid adding too much water, which creates a slushy pit. The result is eventually a large mass of ice sitting in the valley. 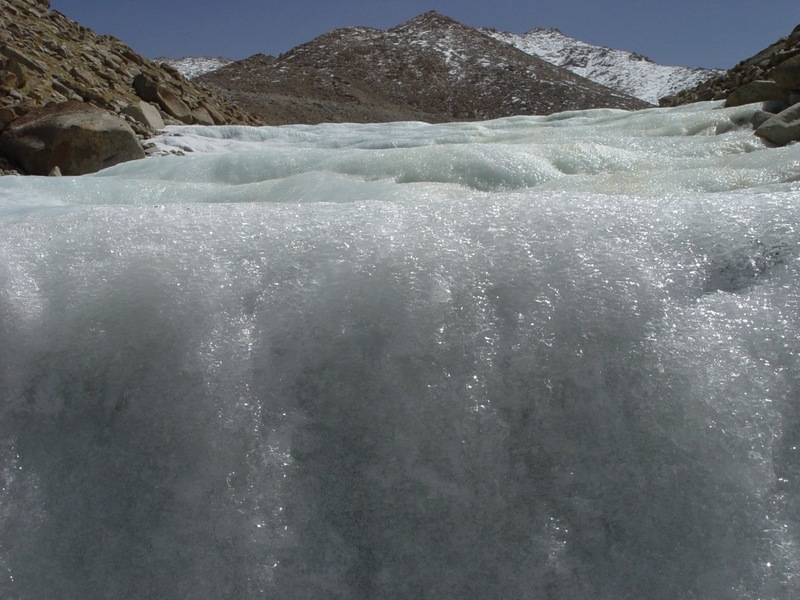 This ice, situated at much lower altitudes than natural glaciers, melts much earlier, providing irrigation water to farmers in the early spring. More water means more food. In some villages agricultural yields have been declining along with decreasing amounts of glacial runoff. For these villages, caught on the precipice, even a small amount of additional water may allow them to stay in their ancient homes instead of moving down the mountain to be closer to the river and the city. To live by the river is thought by most Ladakhis to be undesirable. The river water is considered dirty, not only because of the muddy color, but by virtue of the many people upstream using it in homes and fields. Ladakhis are notably conscious of good hygiene; to put ones’ mouth directly into a water source is to irreversibly pollute it. Living downstream from others is thus polluted territory. The Indus River Valley is the urban center of Ladakh, called by some the “Crossroads of the Himalaya,” after the ancient spice trade routes that established the city. Teenagers view the internet cafes and shops hawking skinny jeans and black-and-white checkered sneakers as glamorous and modern, but parents bemoan the loss of culture when teenagers “hang out” with friends in internet cafes after school, instead of coming back home to milk the cows and help in the fields with their families. Yet with water decreasing, many families may need to reconsider city life and the Indus River, if the streams that feed their crops year after year continue to dwindle. The village of Kumik, located in the remotest corner of Ladakh, a region called Zanskar, recently made the difficult decision to do exactly this. In 2001, a town meeting was called. The trickling water had run out a few weeks before the crops were due to be harvested, and crops had failed. It was a pattern that had repeated itself multiple times, and the villagers were seeing themselves in an increasingly precarious situation, forced to sell much of their livestock after yet another crop failure. At their town meeting the Kumikpas, as the people of Kumik are called, decided to move their village several kilometers away to land bordering the river. The land is flat and empty, barren of the hundreds of years of accumulated familial history, but it will provide water, and this is a tradeoff the Kumikpas felt pressed to make. 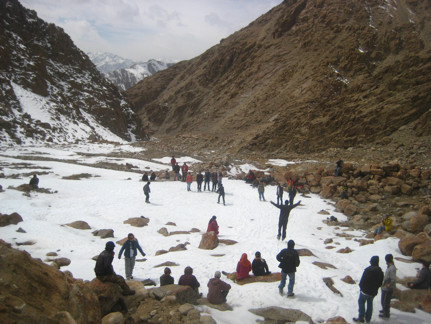 Artificial glaciers in this way may provide more than water; they may provide the next generation of Ladakhi youth with a reason to stay on their land, to resist the multiple forces pulling them down the mountain. It’s a chilly late-April morning and our Mazda school bus shudders to a halt on the steep incline for the third or fourth time. Forty or so Ladakhi high school students cheerfully and noisily spill out of the bus and prop rocks behind the wheels, then begin pushing behind the straining school bus. Across the dusty back window white letters spell out “LOVE WILL KEEP USALIVE.” The driver of the bus, who looks no more than sixteen years old, shouts directions over Bob Marley’s “No Woman No Cry” while revving the engine, and suddenly we begin to move uphill. There is a collective cheer, as students run alongside the slow-moving school bus and are pulled in by their friends; stragglers leap onto the ladder on the back and clamber onto the roof of the bus. We’re rolling again, slowly chugging up the vast mountain towards a bluebird sky, snowcapped peaks, and, somewhere in these barren brown hills, an artificial glacier. Hours later, we’re still moving up hill, though now on foot. The school bus finally gave into gravity and remains stranded at a hairpin turn miles below. Ladakhi teens in hooded sweatshirts imprinted with the logos of skateboard companies and skinny jeans, or wearing traditional salwaar kameez and headscarves, trail after the unstoppable Mr. Norphel with well-worn hockey skates dangling over their shoulders, blades glinting in the mid-day sun. The first two artificial glaciers have already melted, supplying water to the fields below, and we are hiking up to 16,000 feet to see if Artificial Glacier #3 at Stakmo remains. Reaching a massive boulder field, Mr. Norphel pauses and, with a wide crinkle-eyed grin, asks us trailing foreigners: “Kaxpo dug-a-leh?” (Difficult enough?) Just as some are despairing, there are cheers from ahead. Artificial Glacier #3 has been found. Reaching the top of the valley perhaps twenty minutes after the first Ladakhi teenagers, I find myself standing on the edge of an oval ice skating rink, watching a blur of colors dance across the vast expanse of white. Mr. Norphel and I watch the teenagers frolic. The kids may appreciate the ice skating rink, but what they’re really skating on is an investment in the future. The water will give their families the resources to irrigate fields that have lain fallow, requiring more hours of labor from everyone in the village, including these teenagers, and resulting in enough food for families all year. As the sun drops behind the mountain, Mr. Norphel and I keep hiking uphill to inspect the irrigation channels that feed Artificial Glacier #3. “This one is pretty good, I think,” says Mr. Norphel. “There is still lots of ice. But next year we will improve it.” In this cold place, high in the Himalaya, hope is alive. Optimism is in the air at 16,000 feet. Below, two boys in rainbow knit scarves tear after each other, and a girl in a bright orange hijab, salwaar kameez and hockey skates launches off a steep drop off. She flails for a second midair, and a crash appears inevitable, but then she rights herself. She lands on her feet. A. Kathleen Higgins first found her way to the Himalayas as a teacher with Vermont Intercultural Semesters. She stayed in Ladakh for three years, working with a local NGO, the Leh Nutrition Project, and later supported by a grant from the National Geographic Society, as part of their Young Explorer's Program. She is a graduate of the Yale School of Forestry and Environmental Studies, where she studied climate change and energy policy.